Join thousands of others just like you, who took 5 minutes to change their lives. I Did! As I was looking for website hosts, I accidently found a link to SBI (Site Build It). I had just been laid off due to down sizing and was looking for work and it intrigued me. That anyone could build a website business of their own. I could control it and own it. And I needed no technical knowledge except how to navigate the internet and my passion. I had that. So I started reading. I was soon hooked. I was buying into the story that I could build my passion - lacrosse into a website, and not only a website but a business. And share that with the world. Well here I am. I have a website of 1000+ pages and growing daily. I have phenominal number of visitors and growing. I have complete control of my financial future. Although unlike most people I was fortunate to be rehired quickly and I love my real job, but I have the very unique luxury to know I dont need it. SBI has given me complete control of my life. I now work almost exclusively from home. Take 5 minutes of your time to have a look at how thousands of other people, just like you, have turned something they love, into a business that makes them an extra income. I dare you to find an Internet Host that can do what SBI Does. Teach you how to build your very own business. Are you ready to be your own boss? 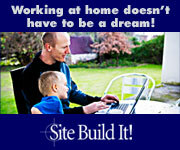 Are you ready to work from home? SBI! makes online business success do-able. Anyone can succeed with an all-in-one process, tools, and guidance. The process is simplified to such a degree that success (i.e., profits, not the mere presence of a Web site) is achievable even for a beginner. For an experienced person, achieving success is even smoother. SBI! really does change lives. You know I have seen many work from home business plans and get rich quick things. What Ii loved about SBI was the fact that they told me from the beginning that this was not get rich quick. That this is hard work, and it is. It takes commitment and passion. I have both. I had a desire to build SimplyLacrosse.com and they gave me everything i needed to succeed long term. Yes, I have to admit that there are probably easier ways to build a Web site. However, online profits require more than just having a collection of Web pages. What is the point of building a website that no one sees. SBI! includes all the tools and a proven process required to build a long-term, profitable e-business. SBI! is the only product I have seen that took the time to prepare me to build a profitable business, before I jumped into building my site. For me as a complete beginner, my learning curve was short because they helped me to bypass any show-stopping errors. For those experienced in site-building, SBI! deepens your level of understanding. No matter who you are, you are guided all the way until you succeed. Why are you still here? Quit thinking about it Just do it! I did. You can see in my websites what SBI has done for me, now go see for yourself how you can do it to. Are you a student? Many Students are taking advantage of this fantastic program that is now being taught in MAJOR colleges and Universities around the World. Spend a few minutes to check it out. You wont be sorry. To see many successfull sbi sites check out SiteSell.org it is the largest, human-edited directory of SBI! resources on the Web.